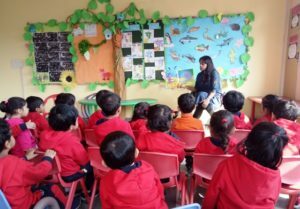 Learning about animals is always fun. It is all the more exciting when you learn about Water Animals. 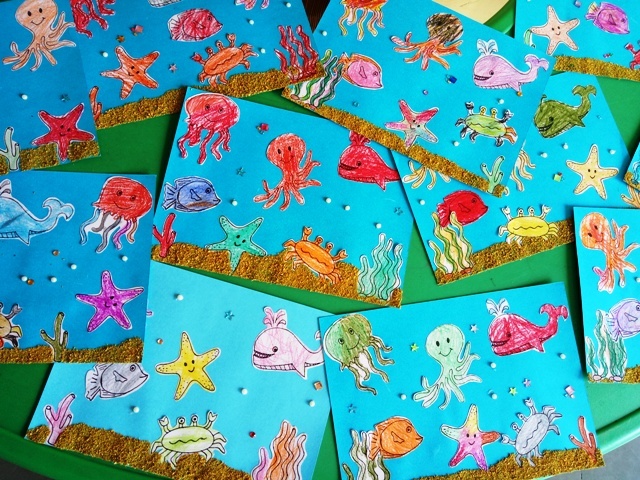 After learning about various sea creatures for almost a month, it was time to wind up our month’s theme. 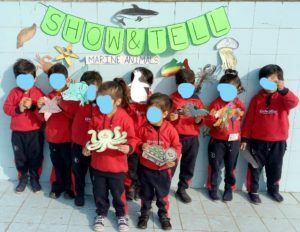 First of all, it was our Thursday activity – herein, all the kids were supposed to get a prop / picture of their favorite marine animal and speak about it. We took this activity inside the swimming pool !!!! It was dried up – due to winters. So, we made all the kids to climb down into the pool. 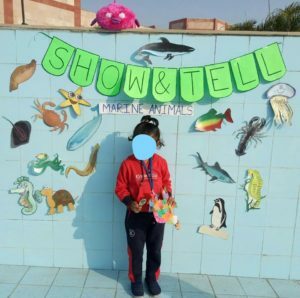 Here I set up the background for the “show and tell” activity by sticking the pictures of various marine animals and hanging the “show and tell” banner above it. 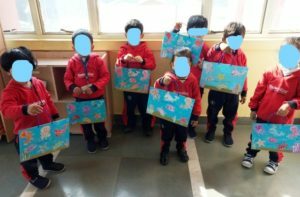 All the kids spoke about their favorite water animals. In the end, we took a group picture too ! 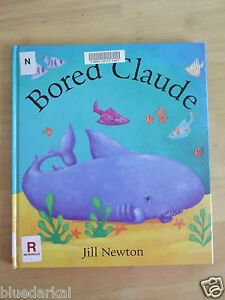 When we went back to our class, I narrated them a story of a whale – “Bored Claude”. 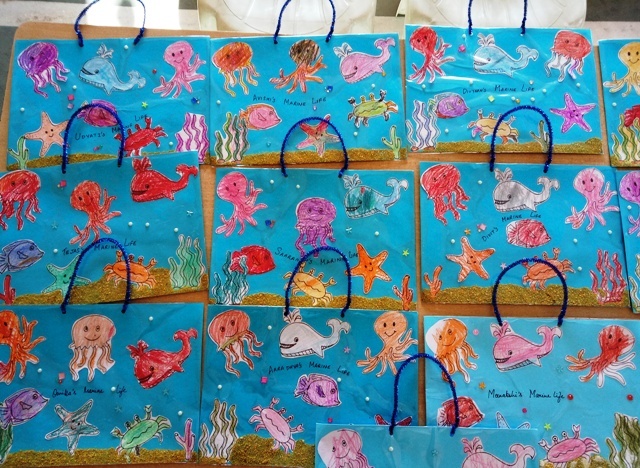 It had various sea animals in it – sea horse, octopus, star fish etc. I had prepared coloring sheets for all the kids in advance. 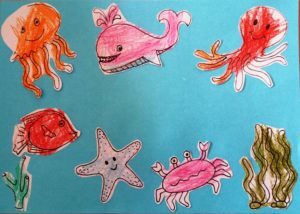 I drew 6 marine animals, some sea weed and a coral on an A4 sheet with a bold marker and made copies for all the kids. After the story, my 3 year olds colored their sheets. 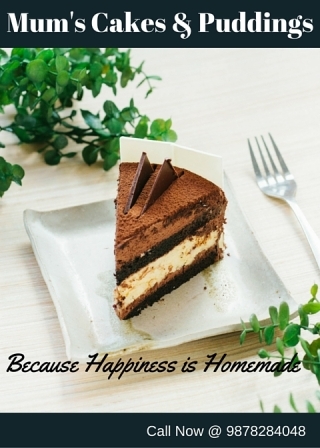 Then, it was lunch time. 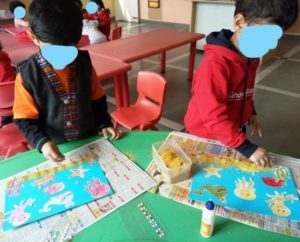 While my kiddies were enjoying their tiffins, I cut out the drawings of every child’s sheet and laid it out on a blue chrt A4sheet. The kids stuck their drawings wherever they wanted on the sheet. Further, we added some sand (golden saw dust) at the bottom of the sheet to mark the bottom of the sea. And lastly, we embellished the sheet with some pearl stickers. Later, I laminated all the work and added a blue color glitter pipe cleaner as the handle to hang the work.